The Blue Lion was my blue 1985 Honda Civic manual 4-speed hatchback. When I got her for $800, she had bad tires, bad shocks, and needed a new head gasket. Oh, and the stereo didn't turn off with the ignition, and when I listened to it, the singers sounded like they were in a bathroom down the hall. I gave her Akane's old tires (which were pretty good...), and I spent $400 replacing her head gasket. Also, her muffler fell apart and was dragging, so I duct taped the end up and had it replaced with a used muffler ($100). I replaced her front shocks (which were even worse when wet). The Lion got 35 miles per gallon, 75% better than Priscilla's 20mpg, but she had no air conditioning. Select a thumbnail for the whole picture. Back. 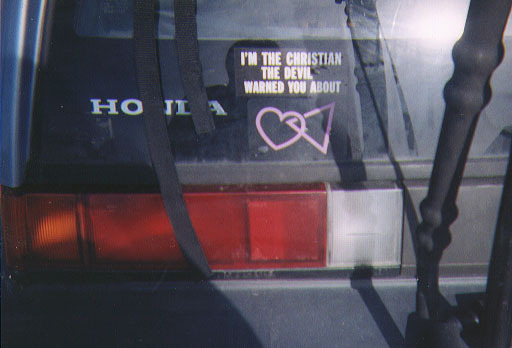 Stickers: P-FLAG, and "I'm the christian the devil warned you about." 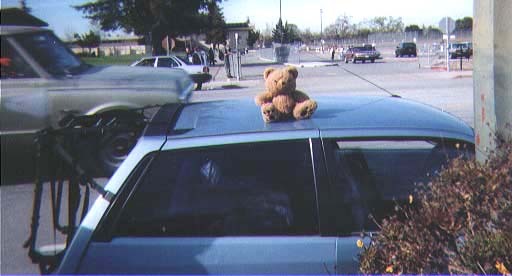 Passenger's side with a teddy bear named Kristine on top. Back to Ashi's Page or anysize.org.